My dad and his wife have been staying with us for a few days. It's been great to have a bit of a break and to explore the County from a tourist's point of view. 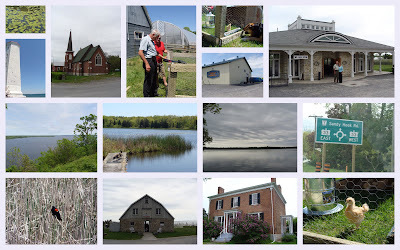 We visited a winery, cider-maker's and a brewery on Friday, went to the Macauley House museum's Lilac Festival on Saturday and off the County to Presqu'ile Provincial Park yesterday. In between the trips we got the tomatoes planted, did a fair bit of weeding, drank generous quantities of local wine and beer (we felt we should show our support for local producers) and, of course, built the chicken run. We also got to go round the County's first ever roundabout a few times on our various trips. I thought it might seem a bit strange to go round a roundabout anti-clockwise, but it didn't, and the other drivers seemed to be coping well with this new way of negotiating a junction. There was a two-hour public meeting about it a month or so ago. I still can't imagine how they filled two hours just talking about a roundabout, but I'm afraid wasn't sufficiently interested to attend the meeting and find out! First roundabout - that's amazing. I can picture everyone approaching it very carefully the first time!